The English Ivy Vertical Wall Mailbox is made in solid brass with the finish and glass of your choice and proudly, American Made. 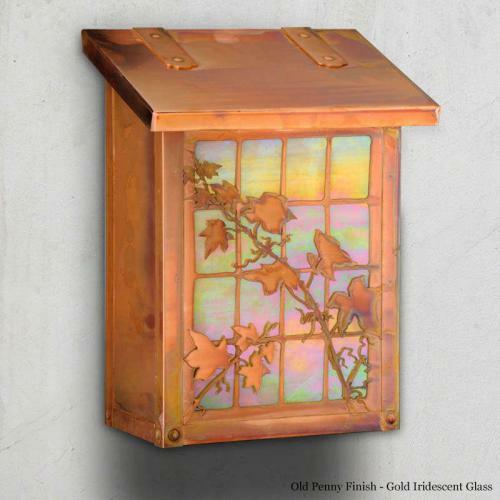 The English Ivy Vertical Wall Mount Mailbox shown in the Old Penny Finish with Gold Iridescent Glass is sure to make everyone think about a beautiful cottage with ivy climbing on a fence. A piece of art glass is mounted behind the Ivy design to highlight it. Our Ivy Vertical Wall Mount Mailbox is handmade of solid brass - in the beautiful craftsman style - and has a traditional hinge detail on the lid and a rubber bumper inside to eliminate any noise when closing. The corner rivets complete the design and give this mailbox it's rugged handcrafted look. Easy to mount and a wonderful addition to your front entry - the English Ivy Mailbox will be a delight for years to come.